The “Wizard” archetype is originally due to TheAlphaCentury (for Brome), while this particular variant was first conceived by Reeeee69 (see his post on Reddit here). Stay alive with all of your heal and removal while sculpting your Action Bar into OTK configuration: multiple copies of Decimus +Tectonic Spikes, together with mana discounts to play them all together. The main thing to keep in mind is sequencing. Natural Selection is good on turns 1 and 2 to remove whatever your opponent plays first, but afterwards it’s best to hold it for after a sweeper to clean up any followup. Brutality is important as a way to buff your attack, and it counts as real removal if you can catch the stunned minion with a sweeper next turn. Upper Hand is unreliable, but it does its job early before your sweepers come online. Rebuke and Storm are your main sources of card advantage, through clearing multiple minions at once. Use them wisely – try to bait opponents into playing into them, but be sure to fire them off before you’re in risk of dropping too low on health. Finally, Thumping Wave is for taking care of minions with annoying death triggers (Aymara, rebirth minions, etc.) or minions that dodge your other removal (like a big Owlbeast). Mostly self-explanatory. 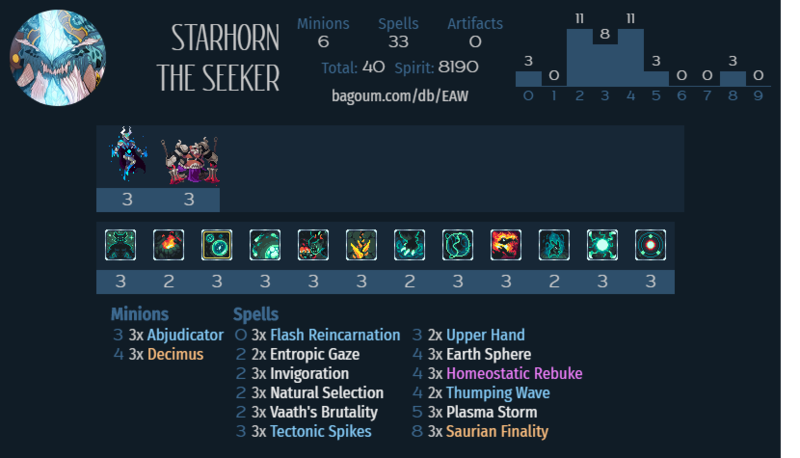 Starhorn’s draw power makes Invigoration actually playable as you’ll be able to find multiple copies. 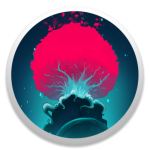 Earth Sphere and Finality are the big heals which really amp up your survivability. Decimus and Tectonic Spikes are the tried and true Magmar game-ending burn combo. Flash Reincarnation is another pure combo piece which allows you to drop multiple Decimi (I think this is the correct plural?) in one turn for a true OTK. Entropic Gaze is a little bit of burn, which gives you something to do in minion-light matchups where your removal is dead. Abjucator accelerates your mana, and is the key card to dig for early in the game. While it’s fine with any hand full of spells, it’s best when you can hit a Finality (speeding up your highest impact play) or Spikes (for the game-ending combo).